This guide is intended to show how the text editor works, and what the different functions are. Above I have a picture of the text editor, which is right above the text box. You'll see it when starting a new thread or replying to a thread. Basically, clicking on one of the buttons will place a BB code into your thread, and you can make your post have all sorts of special formats and effects. I will go from left to right, starting with Bold and ending with Expand. Clicking on the "B" enables the Bold BB code. Simply type what you want in Bold between the Bold BB Code. Clicking the three lines with the numbers 1, 2, and 3 on the right enables the numerical list thread. Very similar to the numerical list, except with bullet points instead of numbers. The code is very similar as well, except it starts with "list" instead of "list=1"
Clicking the paragraph drop down reveals three options. Quote is if you want to enclose what someone said in a format. It helps when breaking someone's post into several parts to respond individually to it. BB codes are disabled inside of it. Spoiler is if you want to hide something, and people have to click the "Show" button to see what you wrote. Enough said Nah just kidding, I need to show the rest of the emotes! and then you have to put in a web address. This allows you to post a link people can actually click on. Clicking any of these changes the position of where you type your text. The default is left, so don't use the left code unless absolutely necessary. Clicking the two arrows will expand the text screen into a "Full screen." Some subforums have special rules or exceptions to the Main Forum Rules. It is expected that you become familiar with these modifications to avoid being confused or breaking rules unintentionally. It is expected that all other Main Forum Rules apply to a subforum unless explicitly defined. In Clan Chat, you are allowed to bump your clan's recruitment thread every 24 hours. It must be 24 hours from the previous bump. Bumping sooner than that will result in the post being deleted and a warning. Consistently breaking this rule may lead to the recruitment thread to be closed and stricter warnings/bans. Flag those posts as "excessive bumping"
Each clan may only have ONE recruitment thread. This falls under the "repeated posting" rule. Posting multiple recruitment threads will result in all but one of the threads (usually the first one) to be deleted, and an infraction. Further repeated posting will result in stricter punishments. Flag those posts as "repeated posting." If about 3+ months have passed since the clan recruitment thread was last bumped, a new thread may be created without breaking the rules, as long as the old one isn't bumped any longer. You may not advertise your clan in another clan's recruitment thread. Only post in another thread if the OP is looking for a clan. Advertising your clan in another clan's thread will result in the post being deleted, and an infraction. Flag those posts as "advertising in another clan's thread"
The RAGE! subforum permits swearing and ranting on these forums. They are a place to vent your anger and rage without receiving an infraction. However, there are lines drawn that cannot be crossed in RAGE. Swearing directed at a person/group of people is not allowed. Similarly, toxicity (as defined in Rule 1), personal attacks, and innapropriate content (besides swearing) are not allowed in RAGE! Flag those posts as "toxic posts" or "personal attacks"
And swearing is not allowed in the titles of RAGE! threads. Back when I was in seventh grade, me and this girl were good friends and we would hug each other to say goodbye after seeing each other. Then for some reason we didn't do it for a couple of months (she usually initiated the hugs). Then I asked her (over e-mail) if we could do it again and I guess I made her feel uncomfortable or something, and she didn't talk to me for some time. I also got lectured by my parents several days later. I can usually block out stupid stuff from my memory, but this one sticks with me today. Happily though, me and the girl moved on with our lives and we talk again and we're good friends again. She is dating someone else but I don't care (I didn't want romance that early in my life), in fact, I'm happy for her right now. It's key to take the dumb and negative experiences we have and turn them into learning experiences so that if faced with a similar issue we can try to avoid it. Learning from it and actually applying what we learned is a sign of maturity and wisdom. WHY is there a censur system? What is this badge and why is it so rare? See where the reactions are and see if you guys can find the "Promote" reaction. Idk if it is mod-only. It is to the left of "Insightful." I do know it is worth the most "reaction points." You are just a noob at drawing. 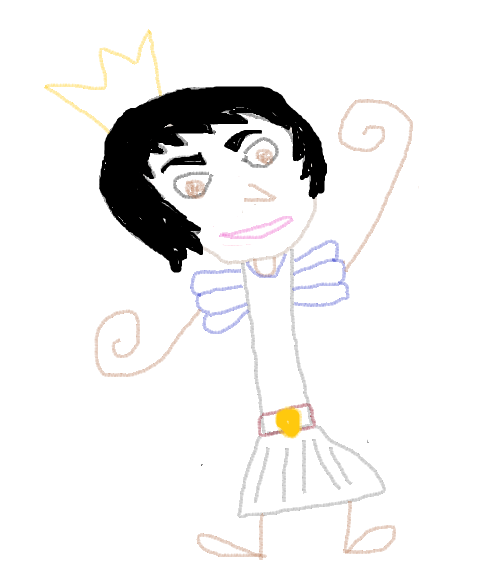 Look upon the mesmerizing beauty of princess I drew and learn the way of art. Special thanks to MS paint.